The current coat o airms o Mexico haes been an important seembol o Mexican politics an cultur for centuries. The coat o airms depicts a Mexican Golden Eagle perched upon a prickly peir cactus devourin a snake. Tae the fowk o Tenochtitlan this wad hae strang releegious connotations, but tae the Europeans, it wad come tae seembolise the triumph o guid ower evil. The naitional coat o airms is an aa uised in the Seal o the Unitit Mexican States, a modified offeecial version uised bi the federal, state an municipal govrenment. The coat o airms recaws the foondin o Mexico Ceety, then cawed Tenochtitlan. The legend o Tenochtitlan as shawn in the oreeginal Mexica codices, paintins, an post-Cortesian codices dae no include a snake. While the Fejérváry-Mayer codex depicts an eagle attackin a snake, ither Mexica illustrations, lik the Codex Mendoza, shaw ae an eagle, while in the text o the Ramírez Codex, Huitzilopochtli asked the Tenochtitlan fowk tae leuk for an eagle devourin a precious bird percht on a prickly peir cactus. In the text bi Chimalpahin Cuauhtlehuanitzin, the eagle is devourin somethin, but it is no mentioned wha it is. Still ither versions shaw the eagle clutchin the Aztec seembol o war, the Atl-Tlachinolli glyph, or "burnin water." The oreeginal meanings o the seembols wur different in numerous aspects. The eagle wis a representation o the sun god Huitzilopochtli, who wis vera important, as the Mexicas referred tae themsels as the "Fowk o the Sun." The cactus (Opuntia ficus-indica), full o its fruits, cawed "nochtli" in Nahuatl, represent the island o Tenochtitlan. Tae the Mexicas, the snake representit wisdom, an it haed strang connotations wi the god Quetzalcoatl. The story o the snake wis derived frae an incorrect translation o the Crónica mexicáyotl bi Fernando Alvarado Tezozómoc. In the story, the Nahuatl text ihuan cohuatl izomocayan, "the snake hisses", wis mistranslatit as "the snake is torn." Based on this, Faither Diego Durán reinterpretit the legend, sae that the eagle represents aw that is guid an richt, while the snake represents evil an sin. Despite its inaccuracy, the new legend wis adoptit acause it conformed wi European heraldic tradeetion. Tae the Europeans it wad represent the struggle atween guid an evil. Awtho this interpretation daes no conform tae pre-Columbian tradeetions, it wis an element that coud be uised bi the first missionaries for the purposes o evangelism an the conversion o the native fowks. The bird featurt on the Mexican coat o airms is the Golden Eagle. This bird is kent in Spainyie as águila real (literally, "ryal eagle"). In 1960, the Mexican ornithologist Rafael Martín del Campo identified the eagle in the pre-Hispanic codex as the Northren Caracara or "quebrantahuesos", a species common in Mexico (awtho the name "eagle" is taxonomically incorrect, as the caracara is in the falcon faimily). Even sae, the golden eagle is considered the Mexican eagle for offeecial purposes, an for the same reason is considered the offeecial bird o Mexico. When Faither Duran introducit the snake, it wis oreeginally an aquatic serpent. But in 1917, the serpent wis portrayed as a rattlesnake, acause it wis mair common than the aquatic varieties in pre-Hispanic illustrations. As a result o this, the design an colour o the snake on the modren coat o airms dae no correspond wi those o ony species o snake, an wur inspired bi the representations o Quetzalcoatl, a rattlesnake wi quetzal feathers. The emblem haes at least twa abstraction levels. First, the pictographic representation o the name o the Aztec's caipital ceety, Tenochtitlan, as tenoch is the wird for the cactus fruit an titlan means "the place o." On anither level, it represents ane o the maist important cosmological beliefs o the Aztec cultur. The emblem shows an eagle devourin a serpent, which actually is in conflict wi Mesoamerican belief. The eagle is a seembol o the sun an a representation o the victorious god Huitzilopochtli, in which form, accordin tae legend, bowed tae the arrivin Aztecs. The snake is a seembol o the earth an, in certain pre Hispanic tradeetions, a representation o Quetzalcoatl; mair specifically, in Aztec (Mexica) tradeetion, the snake is the representation o Coatlicue, the personification o earth an mither o Huitzilopochtli. In some codices, the eagle haulds the glyph for war tae represent the victorious Huitzilopochtli. This glyph, the Atl tlachinolli, which means "burnin water", haes a certain resemblance wi a snake, an mey plausibly be the oreegin o this confusion. Wi the watter element, the attributit element o the muin, it recaws the meethology an rebirth o Huitzilopochtli, the god an hero o the Aztecs. The fruit o the Nopal cactus, cried Tuna, represents the hert o Copil, the nephew o the god Huitzilopochtli. The god ordered the fowk tae "build the ceety in the place o Copil's hert" (Ramírez Codex), whaur the cactus grew on his land. It an aa alludes tae the human sacrifice customs o the Aztecs. ↑ González Block, Miguel A. (2004). "El Iztaccuhtli y el Águila Mexicana: ¿Cuauhti o Águila Real?". Arqueología Mexicana. Retrieved 2009-01-18. (Iztaccuhtli should be iztaccuahtli and cuauhti should be cuauhtli.) This page shows the beginning of an article in Arqueología Mexicana XII: 70, pp. 60–65 (2004). 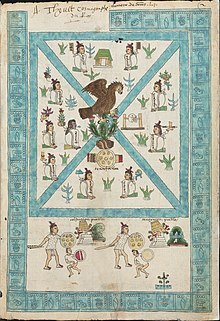 Wikimedia Commons haes media relatit tae Coats of arms of Mexico. This page wis last eeditit on 14 Februar 2018, at 22:58.